A number of distinct groups of edible bananas have been developed from species of Musa. 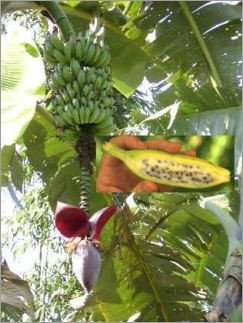 By far the largest and now the most widely distributed group is derived from Musa acuminata (mainly) and Musa balbisiana either alone or in various hybrid combinations. The next but much smaller group is derived from members of section Callimusa (previously classified as Australimusa) and is restricted in importance to Polynesia. Of even more restricted importance are small groups of hybrids in Papua New Guinea; a section Musa group to which Musa schizocarpa has also contributed and a group of section Musa x section Callimusa hybrids.